Would if I could, but seeing that that gauge is property of Microsoft, I can't. I DO know that that gauge is also included in the Steam Edition of FSX. Might want to purchase and grab it from there if no one is willing to help you out. Thanks brother, that's what I thought too. Btw my bro flew the CF-18 back in the days and he thinks you did a great job with this one. Keep on the good work. There is a repair floating around that will restore gauges to default FSX planes you might want to give it a shot. I have it downloaded and will have to upload it. But I might find the file name and do a search for it and drop the link once I find it. I spaced it out when I first saw your post the other day. I know it's been a while, but THE TIME IS HERE! 1. FCS & Flight Characteristics: Thanks goes out to ORION and ROY HOLMES for their help here! --UA & PA Mode Blending: In the previous model, there was a notching or jerking that would occur when flight control logic was transitioning from Powered Approach to Up and Away, or vice versa. This has since been remedied thanks to ORION. The system now smoothly transitions from one mode to the other. If flaps and gear are lowered at approximately the same time, the system will automatically trim the jet to 8.1 once airspeed is within 30 KIAS of calculated landing speed. Once automatically set to 8.1, the pilot is free to reset the trim as he/she sees fit. If gear and flaps are lowered at different times, the autotrim to 8.1 will not occur and the pilot is free to set the trim as he/she sees fit. AUTO FLAP operation has been tweaked to better account for variances in the aircraft's speed. --Payload Configurator: A payload configurator is now available for the jet! 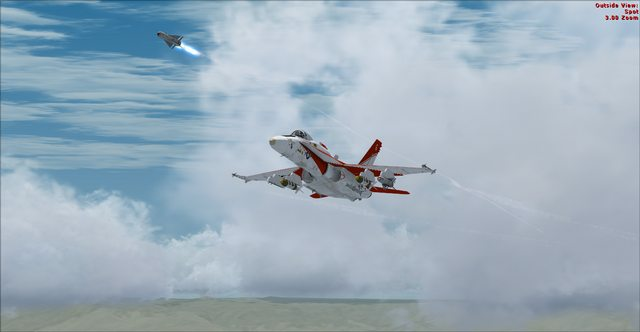 Although it works jets (except for the Blue Angel variants) with or without TACPACK, you will need TACPACK in order to release the missiles, bombs or rockets. The configurator is accessible by pressing Shift+7. You will need to click the "GUNS ONLY" option in order to show the pylons, then you can simply click on which stores you want on the jet. Although stores weight hasn't been adjusted for non TACPACKed aircraft, drag is. You should notice that more power is required to fly equivalent airspeeds depending on what you have attached to the jet. --Weapons Viewable From Inside Cockpit: In addition to seeing ordnance from the exterior, you can now see the ordnance from inside the cockpit as well! 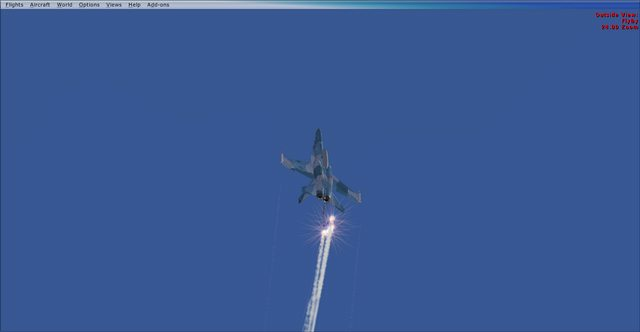 --Viewable In Multiplayer: Tail hook, Wing fold and Refueling Probe from other FSXBA F/A-18C Hornets are all now visible in multiplayer. 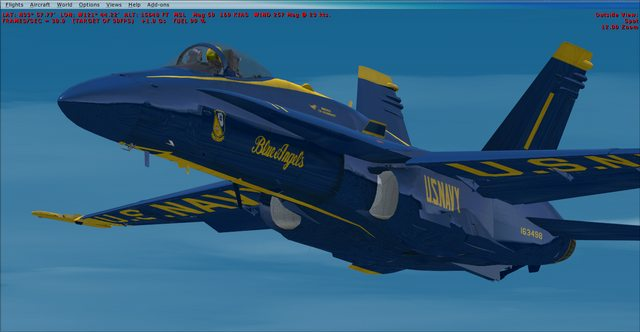 --Blue Angels Gloss Textures: High gloss textures have been implemented on the Blue Angels variants of the jet thanks to CORRADO. --Flaps Switch: Flap switch has been fixed and is now functional. 3. 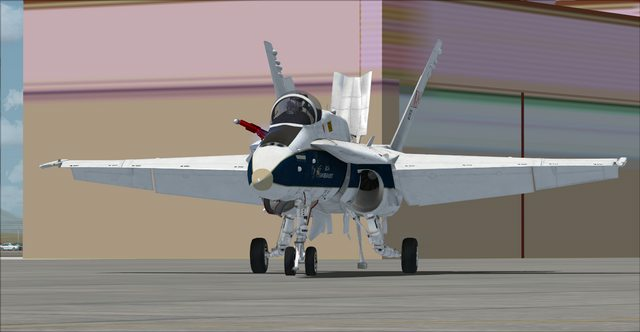 AVIONICS: We are currently starting the lengthy and painful process of transitioning the avionics of the aircraft from those used on the Acceleration F/A-18. This is mainly due to the incompatibility of the existing avionics with newer versions of P3D and Flight Sim World and the increasing functionality of the jet that needs to be integrated into the jet's avionics. --SMS Page: A new SMS page has been upgraded, so that players can now see what stores they have loaded on the aircraft, in addition to having the ability to select and arm the ordnance that they would like to employ for those who have TACPACK installed. This now page is available by pressing the "MENU" button at the bottom of the Left or Right DDI, then pressing the button next to "SMS". --FCS Page: A new SMS page has also been added as well. It reflects the basic FCS readouts for the flight control surfaces. It can be accessed by pressing the "MENU" button and then pressing the bottom button on the right column of buttons on the left or right DDI (FCS option is not labeled on MENU page). --ENG RPM Readout: Engine MIL and Afterburner RPM has been adjusted to better reflect throughout altitude envelope. --Carrier Landing & Refueling Gauges: Now automatically pop up when either the hook is lowered or the probe is extended respectively. The Carrier Landing Gauge has been reorganized to better work and display in conjunction with other gauges. --FCS Gauges: The two FCS gauges that were originally assigned to Shift+7 and Shift+9 have been consolidated and assigned to Shift+9. --Audio Warnings: Thanks to RAZOR, new audio warnings have been added such as "Roll Left/Right" warnings which are transmitted when the aircraft is at a low altitude with excessive bank, a radio chime has been added once the battery is turned on, and updated audio warning cycle has been included with is triggered by the "LIGHT TEST" switch on the right panel. 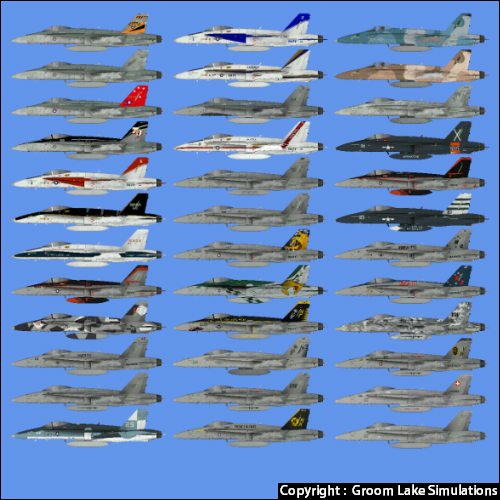 --Thanks to the contributions of GROOM LAKE SIMULATIONS and a few others, we not have over 50 great textures for the jets! 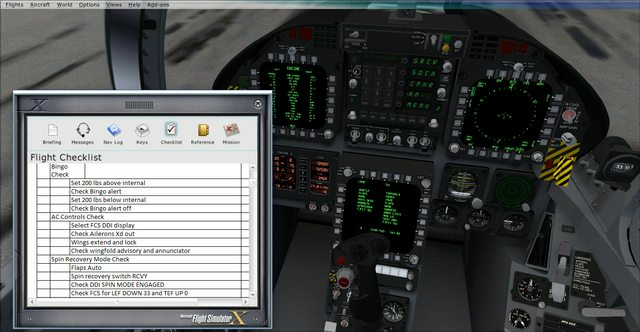 --Functional Checklist: Thanks to HENRY from cNATRA who has included a new functional check list for the jet. -ANIMATIONS: Throughout our work on the 3D models some animations were lost such as the Throttle Cutoff animations. Working to get those working again. 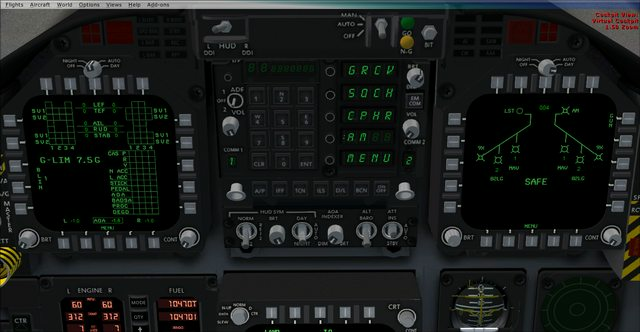 -AVIONICS IN P3Dv4: As mentioned earlier, many of the avionic displays are no longer functioning in the new, 64-bit FSX based simulators such as P3Dv4 and FSW. We have started the process of updating the avionics so that they will eventually work on those platforms. Currently no ETA on when they will be complete though. -FIRE CONTROL: Although the fire control system does work for TACPACK, there are still some glitches here and there. Still working to fix. -ADDITIONAL FUEL WITH DROP TANKS: Still working on being able to have additional fuel when adding drop tanks. As usual, if you see anything, report it! I'll be out of pocket for major changes for the next couple of months, but will get back to it once I'm able. 1. 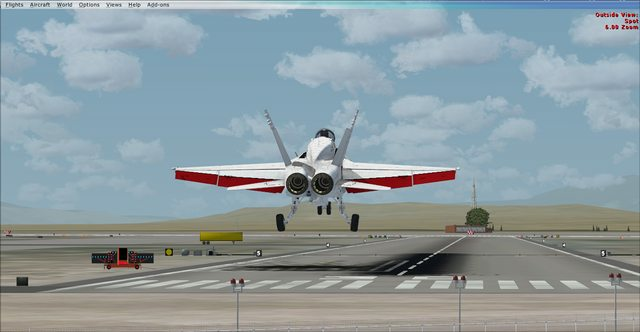 Tailhook for Fleet Version: Clicking on Tailhook in Virtual Cockpit of Fleet jet now functional. 2. 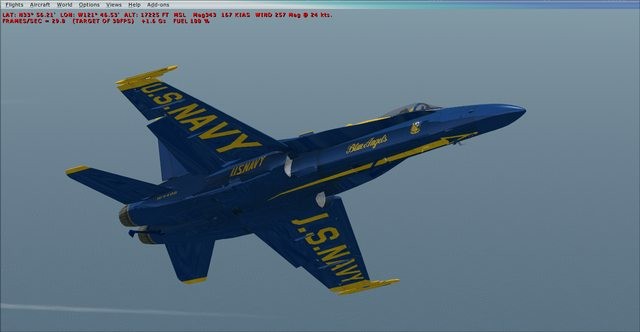 Tailhook/Probe Issue for Blue Angels Version: Tailhook and Refueling Probe now work correctly in Blue Angels variant. Wing fold still an issue. 3. Updated Textures: All textures have been updated to include air intake and pylon graphic details. Awesome work as always Jimi(and everyone else involved), the jet is really starting to come together! As said ! Amazing work ! Thank's to all people involved ! Great work updating the jet Jimi, one thing that's very noticeable is the nose wheels aren't correct, the wheels (not the tires) should be smaller, and the tires should have more sidewall to them. Man, this thing flies so well it is not even funny. It feels really great through the pull. It is a little strong at about a 1/4 pull, I will pay a little more attention to that the next few flights. I did hit my assigned button for the tailhook and got refueling probe instead. So I used the lever inside the cockpit for Tailhook and got the refueling probe again. Then once on the ground, I pull wing fold lever and got the tailhook. BTW that was in BA 1 but pretty sure that is through all the jets. Will check and get back to you. Thanks everyone for the Kudos. I'll pass it along to the team. Jymp - Probably not going to happen bud. For the most part the 3D model is set and isn't going to changes much. Outside of my control or abilities. Sorry. AZ - I'll take a look at the axis curves again for the elevator axis and good catch in regards to the hook/probe/wingfold on the Blue Jets. The Fleet jets should work as advertised. I've fixed the hook issue, but ran into a few snags with the wingfold. I'll update what I have fixed so far, and will again once I have the wingfold issue resolved. 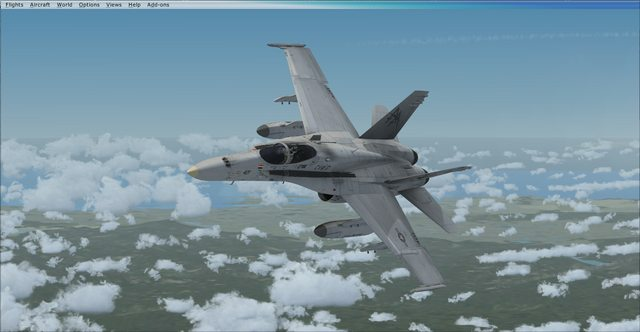 Dave - Sounds like you need the FA-18.dll file that comes with FSX-A and FSX-S editions. 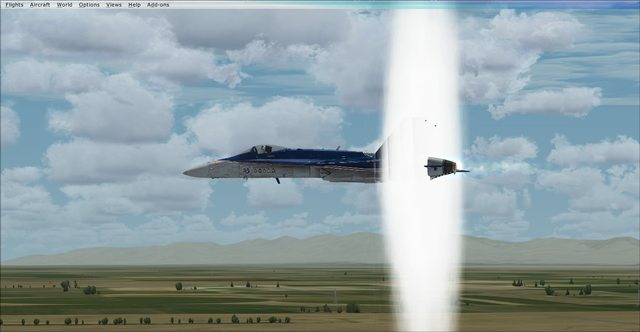 The other issue might be P3D itself, I know on later versions of P3D, the FA-18.dll didn't work, causing a whole host of issue, similar to the ones you've described. But for starters, I would advise, going to your "Prepar3D/Gauges" folder and confirming that you have that FA-18.dll file in there. Hope this helps and thanks again! Yeah, Jimi the fleet jet is fine and functions like it should. The pull is a little strong towards about a 1/4 pull, should I say after the 1/4 pull for me. It could be a system thing, who knows some of the planes act differently on different computers I have found. So I would not change just on what I am feeling, see if others are having the same thing happen to them. Great work for those involved. BZ jimi and team! Off to test around Fallon ranges with TP. I just love it. So far, anyway. Once the new wears off I may find a niggling little trouble here or there, but heck, nothing is perfect. Although this is getting real close! Thanks to Jimi and the whole team for this effort. It's awesome! 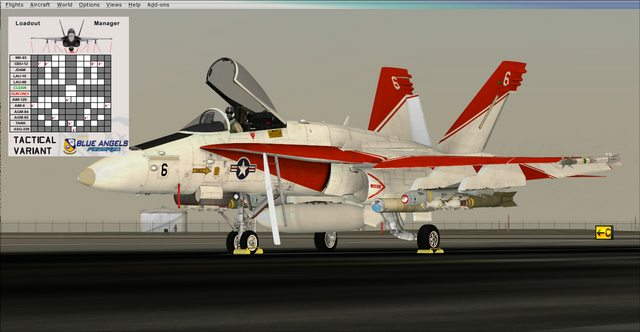 JIMI, I CHECKED AND I DO NOT HAVE THE F18.DLL IN GAUGES, but i have p3d and no fsx.....where can i get this file? and if it does not work in p3d? Maaaaaaan Jimi this jet is the ish! The only thing I'm missing now is that T.M F/A-18 stick! keep up the good work fellas!